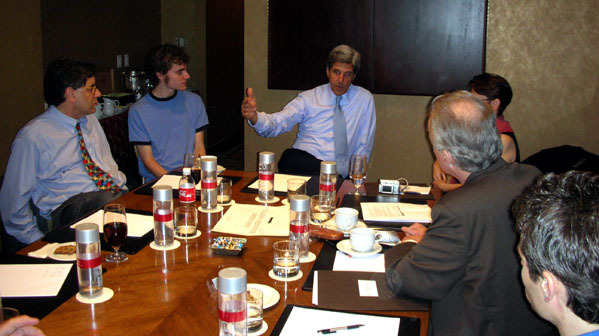 John Kerry speaks at Pacific Conference on National Security in Los angeles meets with bloggers. Kerry came out and joked to the very well dressed crowd that while we were on Avenue of the Stars today, (the street the hotel is on), the Republican party was becoming the Avenue of the Indicted. He also said that Congress is more dysfunctional right now than it has ever been in the 22 years he has been there. The Senator spoke on many subjects, and was clear, concise and confident as he made his points, unlike the man who supposedly beat him in the last election. I was given a copy of the prepared text of Kerry’s speech, but I took some notes of what he said. Some of the more interesting points: He said that the war on terror in Afghanistan was a necessary thing when it was first started, after 9/11, but that Bush decided that he wanted to have a war with Iraq. He called Bush’s Axis of Evil speech a "diversion of purpose" which Bush used to get his war. Bush chose to attack the only country in the region without weapons of mass destruction. Now after three years Iraq still has no Interior Minister and no Defense Minister. Kerry said the problem in Iraq is one of Sunni vs. Shiite, and the only way to solve those problems is through diplomacy. He called for a Dayton-like summit in which all factions are brought to the table, and said that General Anthony Zinni, and Kofi Annan both agree with him that this is the best solution to the problem, and that if the factions can work out an agreement to avoid civil war that the jihadists and insurgents will not be able to survive. Kerry went after Bush’s pledge that "as they (Iraqis) step up we will step down." The goal was to have 272,000 Iraqis trained before we let them take over; as of now 255,000 Iraqis have been trained but not one U.S. soldier has been able to step down. Another point he made was that Iran is delighted with our "predicament in Iraq" because it increases their leverage against us. He said that Bush’s chief-of-staff Josh Bolten plans to use threats from Iran in the Republican’s election strategy, and they will try to create fear that if we don’t attack them they will attack us. Kerry is adamantly against us doing any kind of bombing of Iran. He said he accepted his responsibility for voting to use force in Iraq, and that we must not make the same mistake again. He concluded by saying that according to the experts he has heard from, Iran is 5 to 10 years away from having nuclear capabilities so we have time for diplomacy, and that we need to repair what he called the gaping hole in the Nuclear Proliferation Treaty. After the speech Kerry took some s from the audience of the Pacific Council. One criticism of the past is that Kerry gives long winded answers to s, and is not able to come to a simple point. I noticed this as he was answering the s, since during the 20 minute Q&A he got to only four s. At the end Warren Christopher got back up and said that Kerry had made the meeting of The PC one of the more memorable in the recent past. Christopher saidhe would be remiss if he didn’t ask if Kerry plans to run, to which Kerry said he is thinking seriously about it, but right now is committed to doing as much as he can to help Democrats take back Congress this November.. When it was over Kerry mingled with some members of the PC, then I and the other bloggers were brought up to a small room for our meeting with The Senator. 10 of us sat at a small conference table and introduced ourselves. A few minutes later Kerry walked in, went around the room shaking hands and meeting everyone. He was very friendly and already knew a few of the people so it was very informal. John Kerry meets With Bloggers The meeting was off the record so no one took any notes or recorded what was said. The first went straight to the point, about how pissed off so many Democratic voters, are about what happened with the election, and also that it seemed like most Democrats in Congress had no idea how bad the situation was. Kerry responded by dropping the whole political routine and speaking like he was off the record to a bunch of people that already know what’s going on anyway. "Look I know how bad things are, I know that people are pissed off, I know we screwed up." He talked about some of the mistakes that were made on his campaign such as having the convention five weeks before the Republicans and about how, with a 13 week campaign schedule instead the eight week schedule of the Republicans, he was unable to spend money in August because they needed it for the stretch run. It was during that time that he got attacked by the swift boaters. He said that they tried to attack him twice before, and he was able to rebut them with the truth immediately and slap them down, but the third time they got a $5 million check from T. Boone Pickens, and another $3 million from someone else, and they were able to get their message across by spending the $8 million. H.L. with the PresidentI got to talk to him as we walked down the hall and rode down in the elevator together. I asked him about the Robert F. Kennedy piece that is coming out today in Rolling Stone in which Kennedy says that all the allegations of election fraud in Ohio are true, that the election was indeed stolen from Kerry, and that Kenneth Blackwell was definitely involved and it possibly went all the way to the White House. 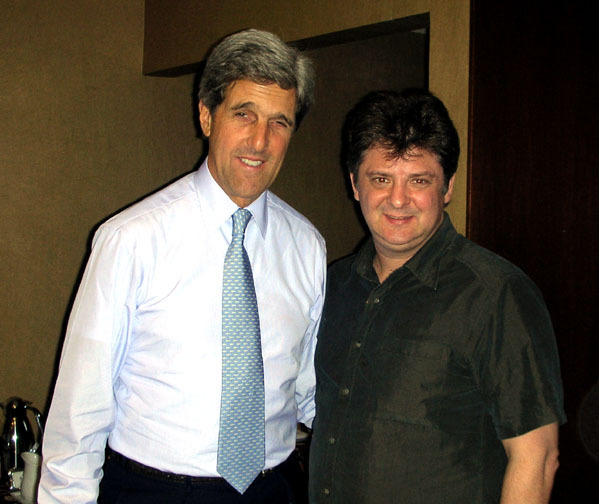 Kerry said he had seen the story and that he was quoted in it. I knew I only had a couple of minutes so I asked him "what can the Democrats do to make sure that this type of voter fraud does not happen as it has in the last two elections?" He looked at me and said we have to make it a state by state issue. If we try to do something about it at the federal level with the Republicans in power they will end up just making it worse then it already is, but if each state can pass resolutions banning electronic voting that we could stop it. I pointed out to him how California had done just that but then Arnold and the California Secretary of State had the Diebold machines recertified. He paused for a second looked at me again and said in the sincerest possible voice, something like, "You know this is something we are really going to have to make an issue of and work on" It was almost as if it was the first time he had even thought of it. Then, as the elevator doors were opening, he shook my hand, put his other hand on my shoulder and said that it was really nice to meet me. The doors opened and he was gone. On his way to another event tonight in Whittier. H.L. reviews the new movie "The Road To Guantanamo"